Eilene’s friends are coming over again and Jan suggested that I make a quiche. Several years ago Jan taught in Paris and brought me back a French cookbook. I have attempted several recipes from it, but I have never been able to follow their directions. 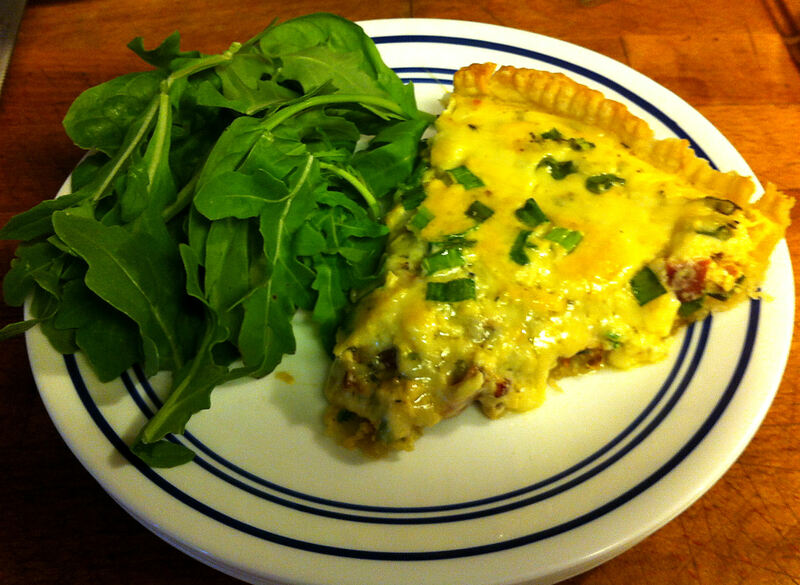 Quiche Lorraine is simply fancy French “breakfast for dinner.” Bacon, eggs, and toast, but it is how they go together that is important and different. Like Frank Sinatra: ♪ I did it my way ♪. 1. Sift the flour and salt together several times in a large bowl to get a complete and even mixture. 2. Use a box grater to shred the butter into the flour. Tip: As the butter shreds build up in the bowl, stir them into the flour to coat them. 3. Use a pastry cutter to chop the shreds into tiny pieces. Tip: To get a flaky crust the butter must remain cold, so that it does not bind with the flour. You want to handle the butter and dough as little as possible with your warm hands—why Jan has always been better at crusts than me. 4. Measure out one third cup of ice water and add the vinegar. 5. Make a “well” in the flour and add the liquid. 6. Use a spatula to mix the flour into the dough until most of the dry flour has been incorporated. 7. Turn the dough out onto a clean smooth surface and knead the dough 3-5 times. Tip: Not 3-5 minutes, only 3-5 kneads, the more you handle the dough the more the butter will melt and the more gluten will form, making your crust tough. 8. Wrap the dough in plastic wrap and put it in the refrigerator to chill for one hour. Note: This gives the flour time to completely absorb the water and for the butter to re-chill. 9. Preheat the oven to 375º F.
10. On a well floured smooth surface, roll the dough out into a 11 inch circle. 11. Cut parchment paper into a nine inch circle and place it in the bottom of the pan. Tip: Some spray oil will help keep the parchment paper flat. Note: The paper prevents the crust from sticking to the pan and makes it easier to remove slices when after it is baked. 12. Lay the crust in the pan and smooth out any bubbles. Press the dough up the sides and over the top edge. Tip: Trim off any excess and use the tines of a fork to decorate this edge. 13. Prick the dough on the bottom of the pan several times and lay some aluminum foil over the dough. Note: I use lead weights, so it is very important not to let my weights touch the dough. 14. Scatter dried beans or small pie weights over the foil. Tip: The weight prevents the crust from puffing up during the initial baking. archaeology digs at our daughter’s schools while they were growing up, so we have picked up some odd bits during our travels. Tumpline, anyone. 15. Bake the crust for 10 minutes at 375º F and then remove the foil and weights. Tip: Do not discard the foil, you will be using it again later. 16. Continue baking the crust for 10 more minutes. Tip: A pie crust shield is very useful to prevent the top edge of the crust from burning. 17. While the crust is baking, fry the bacon until crispy and then chop the strips into small to medium pieces. Place the bacon on a paper towel to absorb excess grease and reserve. 18. Drain off most of the bacon grease from the pan and fry most of the green onions until soft—but not browned—about two minutes. Reserve. Tip: Reserve ¼ cup of the green parts for the garnish. 19. Remove the crust from the oven and reduce the oven temperature to 325º F.
20. Let the crust cool for a few minutes. 21. Put the eggs in a medium bowl and whisk lightly. 22. Add the cream, mustard, thyme and pepper. Whisk to blend. 23. Pour half of the egg mixture into the cooled crust and scatter ¾ of the bacon bits evenly over the eggs. 24. Scatter the fried onions evenly over the eggs. 25. Scatter ¾ of the cheese over the eggs. 26. Pour the rest of the egg mixture into the pan and scatter the remaining bacon over the top. 27. Bake the quiche for 30 minutes at 325º F.
28. 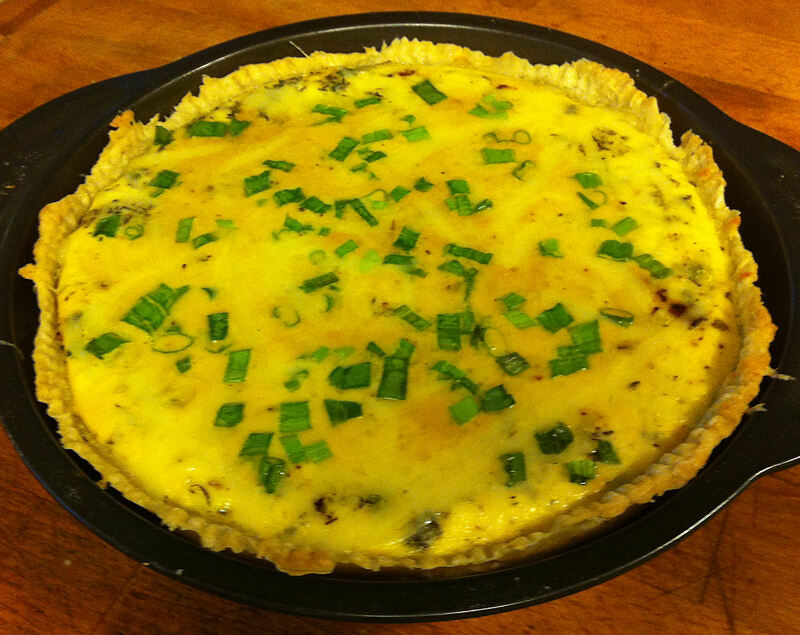 Scatter the remaining cheese over the quiche and garnish with the reserve green onion tops. 29. Continue baking for 15-20 minutes, until the eggs are just set. Tip: Jiggle the pan, the center of the eggs should not ripple when it is done. 30. Remove the quiche from the oven and cover it lightly with the aluminum foil. Note: In, my mother, Claudia’s day, you would insert a toothpick into the center of the eggs and when it came out clean, you would remove the quiche from the oven . Overtime, I have found that this actually means that the eggs are overdone. When you take the quiche out of the oven, the heat of the dish will continue to cook the eggs while the pan is resting on the counter. 31. Let the quiche rest for ten minutes and then cut and serve it.